I kind of like that new phoenixes are a regular feature of new Magic sets. There was a time when basically every red creature with flying was a dragon, every green creature with reach was a spider, and so forth. But the universe is a bigger and more diverse place than that, and new releases should reflect that. Talking of diversity, though, the mechanical designs you see on phoenixes are a little less diverse: you can reasonably expect any of them to come back from the graveyard, but the conditions vary wildly, as illustrated by Arclight Phoenix. Three instants or sorceries in one turn is a lot for most decks; certainly for the kinds of red decks that like creatures with haste, unless they’re built like the Modern burn decks (and those ones quite often don’t want any creatures at all). 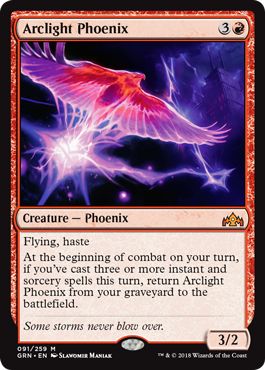 If, however, you’re playing something more like a midrange spellslinger deck in blue and red, and you have access to lots of the card selection spells like Preordain, the Phoenix is the sort of card that other midrange decks can struggle to deal with permanently. You’ll also have the counterspells and other tricks to deal with the cards like Path to Exile and Unmake that can address it. The Obligatory Phoenix of Guilds of Ravnica definitely is more an Izzet card than a Boros card, since its ability rewards casting a lot of spells. If you can chain together enough spells, the bird can make a triumphant return at the start of combat to swoop upon your opponent. Thankfully, jump-start plays well with the idea of chaining together enough spells, and spells like Opt do exist to get you there. But even before the ability comes into play, a 3/2 with haste and flying is a nice start, and a 3/2 with haste that can keep coming back is even better. Arclight Phoenix is not a draft bomb, as it’s unlikely you’ll get to being it back unless your drafting has gone very narrowly towards this singular goal. But it’s apt to swoop early and often in Standard as a hard-to-remove finisher.